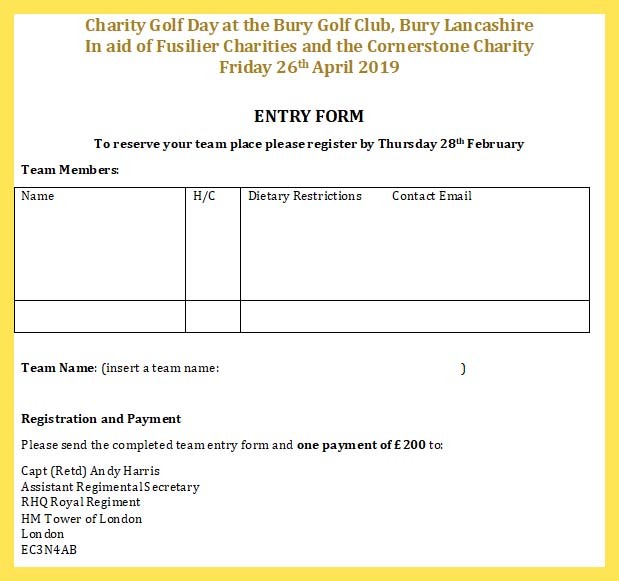 You are warmly invited to join the Royal Regiment of Fusiliers and Cornerstone in a Charity Team (Four players) golf day which will be held at Bury Golf Club, Bury, Lancashire on Friday 26th April 2019. Bury Golf Club is recognised as North Manchester’s premier golf club with some some classic holes, including three designed with the famous McKenzie two-tier greens. Whilst not long, (6088 yards), this deceptive course requires accuracy more than distance – a great challenge for the enthusiast. The competition will be a stableford based competition. We are looking for a maximum of 22 teams to enter. There will be team prizes, nearest the pin, straightest drive, best front and back nine plus some surprise prizes. The aim is to raise money for some very worthy charities but at the same time have a have a fun day with great golf on a fantastic course. The cost of a team of four will be £200. Teams can be all female, all male or mixed. Please note that all money raised will be divided equally between the two charities because some very generous sponsors are funding the costs of the event in support of the two charities. Fusiliers are known for their loyalty, service, example and cheerfulness. We are renowned as tough partners in combat, a reputation hard-won on operations. Our motto “Once a Fusilier always a Fusilier” means exactly that: looking after our soldiers, serving or retired, throughout all their life. The money raised at this event will help us to look after those who are serving or who have served with the Regiment and their families. or if you wish to send a cheque please make it payable to the Fusiliers Fund.